With the upcoming FSL visit of a real life astronaut and having attended two events with Chris Hadfield, I decided to look into the possibility of living on Mars. 1 year on Mars has 687 days and 1 day has 24 hours, 39 minutes, 25 seconds. Landing near the equator on Mars would allow astronauts to find a high of 70 F during the day but at night it can reach -100 F.
The Martian terrain looks a lot like certain parts of the earth- the high deserts on Hawaiian volcanoes- where the astronauts can use inflatable greenhouses to grow food. 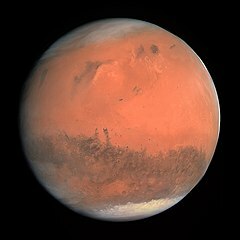 Mars’ atmosphere is made up of 95% of Carbon dioxide (C02), so oxygenating Mars’ atmosphere could be a 1000-year plus job. Neil de Grasse Tyson is skeptical that people will rush to go there and stay. The Red Planet has a very thin atmosphere and no global magnetic field. Therefore, deadly cosmic rays and UV radiation is covering the Martian surface. To survive under these deadly conditions we would have to create an entire infrastructure that would mimic life on Earth. Elon Musk suggested we could warm up the planet and get lots of water flowing by setting off a number of atomic bombs at the poles. Stephen Petranek, a science writer and technologist, explains us in a Ted Talk how we will survive on Mars. So maybe one day we would look in awe and marvel at the site of life on Mars just like we did in 1969 when Neil Armstrong stepped on the Moon.